Vrindavanlila Dasi ha compartido su álbum. 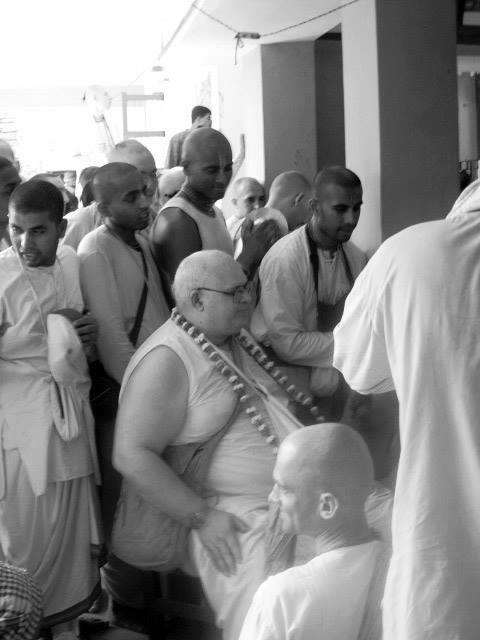 "In Mayapur the main business is to chant Hare Krsna"
BRAHMANANDA PRABHU in Mayapur, 2002. B: Prabhupad’s vision for Mayapur was a wonderful temple to fulfil the vision of Bhaktivinoda Thakur and also a self-sufficient community. Prabhupad stressed self-sufficiency – grow your own food, process the food… use bulls and cows, produce as much as possible of your requirements, like cloth, power. We had Gobar gas to provide not only cooking gas, but also we used to provide the power for lights and fans. Of course Gobar comes from Gosala… Prabhupada wanted us to produce our own food. Grihasthas, brahmacharis and even sanyasis - imagine, behind a plow (laughs)… Prabhupada stressed using the oxen for plawing. But it’s very difficult to do. At one point I was the manager here in Mayapur, for a very short wile, but one of the things I did… because they were having so much difficulty using the oxen to plaw the field, some devotees talked me into getting a plawing machine, it was called ‘Power killer’ – you walk behind it, it runs on petrol and it plaws, cuts and grinds - so many things. So, I bought this machine, I remember it was costing Rs 40.000, at that time it was a lot of money, when Prabhupad found out that I had done that he was very angry: “Why did you introduce machine into Mayapur?” He said: “You see, the machine is very expansive to operate, and then it will break and you won’t be able to get spare parts and soon it will be cast aside as inoperable…” And this is what happened - it didn’t last. So… I don’t think they use tractors here. Do they use tractors? MK: Did Prabhupada specify what kind of business devotees have to do to support the project? B: Business is to produce necessities, like oil for cooking and for burning and cloth, all the foodstuffs, medicines, herbs. Prabhupad stressed simple living, high thinking, that was Prabhupads vision, whether we can abide by that, I don’t know. In Mayapur the main business is to chant Hare Krsna and that is being done so nice and so pleasant, the best kirtans are here in Mayapur, non stop kirtan, of course we have also been doing bajan-kirtan, with Prabhupad in the beginning that’s how he was having the kirtans, they were going on for hours, Prabhupad was chanting for three hours without stopping, very intense and we have been doing that here in Mayapur and I found that very enjoyable, not wild kirtans but actually very peaceful, beautiful kirtans and get concentrated on hearing as well as chanting. We had been doing in Tamal Krisna’s room and all over places, on Parikrama. MK: Did you say that Prabhupada used to do sitting kirtans? B: O, yea, in the beginning. Prabhupada chanted and had kirtan for 3 hours. 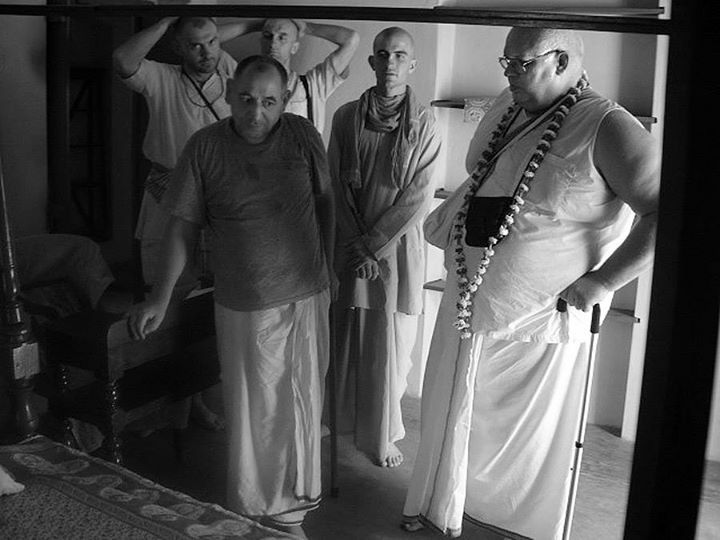 MK: When did you come to Mayapur for the first time? MK: Please tell us little more about services you had done in Mayapur. B: When I came, first I was involved in the construction of the Lotus building. At a certain point they run out of cement and steel and no one could get any more. It was very difficult, you had to get government license. You couldn’t just buy it. And nobody could get the license. And… previously I was with Prabhupad in Vrindavan and we were building the Temple there and the same problem was there. So, Prabhupad directed me how to go to the government offices, what to say, how to get the licenses, very laborious process – from one office to another, to the next, to the next, to the next… I had to be very patient, flattering everyone, preaching as well. So, I had that experience. I went to the Writers Building down town Calcutta, spend the whole day there, but finally I got cement and steel license. Then I had to get the money to purchase it. We had about 6 lorries full of cement and steel on top of the cement. Then I drove out of Calcutta. I couldn’t sit in the cabin, the fumes were very uncomfortable, and so I sat all the way on top of the cement. Then whole convoy of trucks came driving in. Bhavananda stayed on the construction site, he welcomed me – I brought cement and steel, everyone was very happy. At one point Prabhupad was here and we had got a shipment of cement. For some reason there was some problem with the workers, may be it was Ramadan or what ever it was, workers weren’t carrying the cement. Prabhupad said: “Our man should do that”. We were lazy… all we do is sleep and eat. So, Prabhupad said that brahmacharies and sanyasis should carry the bags of cement, not hiring labors. Prabhupad had no distinction there, not that brahmanas should do only so called brahminical activities, etc. Prabhupada said that we were all sudras anyway, so we should do the sudra work, but of course do it for Krishna. MK: Were you coming to Mayapur every year before? B: Yea, for the meetings. I was stationed in Africa and I came here for the meetings. MK: Did you notice any difference between how it is now and how it was then? B: I can say one difference that previously when I was coming for the festival, that time there wasn’t any income for Mayapur, very undeveloped. 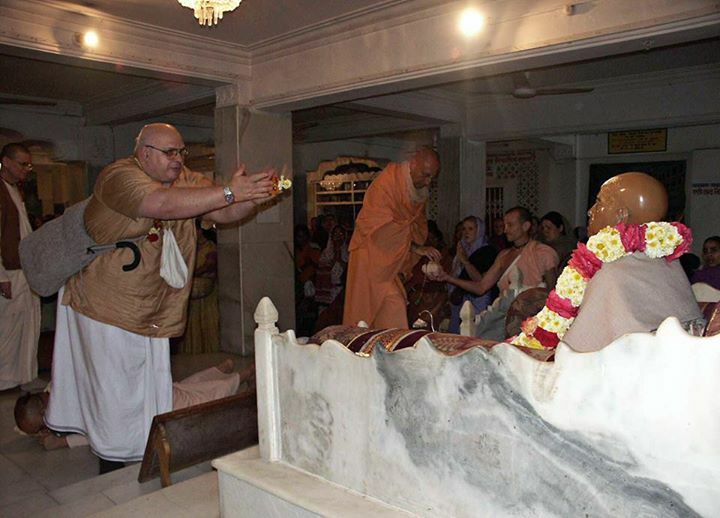 It was seen that the devotees, who come for the festival would be the source of income for Mayapur – there were festival fees you had to pay and they asked you for donations for this and that… for ISKCON food-for-life…different ways of getting money. But it was like taking money from our own man. It seems to be different now – the festival is free and the attitude of the devotees here is different. Now so much loving and service oriented. I would think that the devotees who are visiting here would want voluntarily to give donations for particular projects and so on, without being asked. B: O, really, nobody asked me. One thing is that in Mayapr I found… I haven’t come here actually for over 15 years, what is so nice and attractive about Mayapur - of course the buildings and the gardens and all the projects are going on, but the thing that is the nicest are the devotees who residing here. I find that they have very nice service attitude, Krsna conscious, without passion and agitation. 15 years ago we were very agitated, passionate. It seems that now all the devotees are very nice. Not only devotees but also shopkeepers, local people, very nice attitude, very friendly and I think that comes about when there is the consciousness of the common center which is Lord Caitanya and that makes for very harmonious kind of personalities from psychological outlooks. Of course there are many differences, not that everything is uniform, but with a spiritual center everything falls into place very naturally, harmoniously and makes very pleasant, very peaceful atmosphere. MK: How have you found the facilities in Mayapura? MK: Did you notice anything that could be improved here? B: As far as improvements, one problem is the restaurant. During festival time should be some other arrangement. So many customers want service at the same time. It’s very difficult and quality of food is not good. I think it could be better organized. More workers should be there. Somehow the arrangement should be made differently, so they could serve more people. Another thing on improvements. We should go on decorating Srila Prabhupada’s Samadhi. I hope they have not stopped. So much decoration could be done. And the dioramas could be improved. Specifically the backgrounds are very plain; it needs paintings to make it more realistic. Otherwise sometimes it is just a white wall. And some of them look wrong, like the captain of Jaladuta. He looks like a westerner with this uniform and the bead. Actually the captain of the ship was an Indian, he was not a European. His name was A.Pandiya and he didn’t dress like that. That uniform is like from 50 years before. And this is very important, because captain Pandiya came to see Srila Prabhupada later on, when Prabhupada was giving lectures when He was staying at doctor Mishra’s on 72nd Street in River Side drive. There is a lecture, Prabhupada gives Gita class and captain Pandiya comes. It must have been in November. Prabhupada arrived in September, and then went to Pennsylvania for a month, so end of November – December Captain Pandiya was coming, he kept contact with Prabhupada. He bought a set of books. He is a very important person. So, he has to be done accurately, not like some movie actor from ‘Titanic’. And there is one diorama of Prabhupada in the temple in San Francisco with His first American students and behind Him there is a picture of Hanuman. We never had picture of Hanuman in that temple. We always had Radha-Krishna. MK: But in overall did you like it here? B: Yea, I already said it. I liked because of devotees here. You meet devotees from all over the world here, that’s very enjoyable. That’s another difference, 15 years ago there were mostly Americans and also Europeans coming here, but now there are devotees from many different countries that even Srila Prabhupada hadn’t visited. So, it is very enjoyable to meet devotees from Eastern Europe, South America, Taiwan and also many-many Indian devotees. That we also didn’t have. MK: Would you come here again? B: O, yea! I’ll definitely come every year.